DAYTONA BEACH, Fla. (AP) Rick Hendrick was telling the truth when he insisted this year was going to be much improved from last season, the worst in team history. He moved personnel and split up seven-time NASCAR Cup champions Jimmie Johnson and Chad Knaus. He had a Navy SEAL deliver an inspirational speech to all of Hendrick Motorsports, met with all four of his teams and held luncheons and team-building events. When he sent his teams to Daytona for the 36th time, he sent them to win. 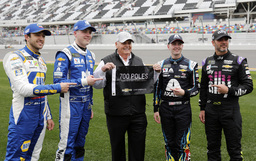 Hendrick horsepower routed the competition in qualifying for the Daytona 500 with a 1-2-3-4 sweep for Chevrolet. A few hours later, Johnson finally won a race after none last season. Hendrick Motorsports is now 2-for-2 at Speedweeks with the front row for Sunday's season-opening Daytona 500 and Johnson's victory in the exhibition Clash. The proud Hendrick organization is using NASCAR's biggest stage to show how serious the boss is about rebounding from 2018, when Johnson was winless for the first time in his career, Alex Bowman and William Byron had forgettable first seasons, and Chase Elliott's three late victories were among the few bright spots. "Last year sucked. I ain't gonna do that no more," Hendrick told The Associated Press just one week before his cars left North Carolina for Daytona. If this was a sequel to "Days of Thunder," with Randy Quaid again playing a version of Hendrick, the car owner might guarantee a Daytona 500 victory. Hendrick, after all, is from a romantic time in NASCAR when a car salesman from Virginia could scrape together the money to enter the Daytona 500 and turn a fledgling little Chevrolet team into one of the most valuable properties in sports. He still believes that with hard work and the right people, a team can step back and admire a glistening race car, confident that girl is a winner. Hendrick still has his folksy Southern charm, still longs for those simpler days of racing, still wants to arrive in Daytona knowing his cars are the very best in the field. So consider Sunday the first day in a new era at Hendrick Motorsports, where William Byron and Alex Bowman gave NASCAR its youngest front row in Daytona 500 history by qualifying first and second. Byron recently turned 21 and begins his second season with Knaus, who split with Johnson after 17 years. Knaus made a statement in 2002 when he and Johnson debuted at Daytona and won the pole in their first race together. He opened this chapter of his career the same way: winning the pole with Byron in their first race together at the Daytona 500. It was the fifth consecutive year a Hendrick car has won the pole for the Daytona 500 and it was the 700th pole for Chevrolet, the only partner Hendrick has had in racing. As Hendrick last season worked through a massive personnel consolidation, Chevrolet struggled with its NASCAR introduction of the Camaro and won just four of 36 Cup races. Rolling off the trucks as the four fastest cars for the Daytona 500 was an important message for the carmaker and its flagship team. "Well, you know, Chevrolet has been awfully good to me," Hendrick said. "That was my first dealership. It's all I've ever raced. It's all my dad ever raced. That bowtie, we're bowtie-proud. What a great day for Chevrolet, our organization, and these drivers. I'm really proud." And that was before Johnson bulldozed his way into victory lane. Johnson is tired of losing and tired of social media trolls telling him he should retire. He also was under mounting pressure from his youngest daughter, who had prayed every night for Daddy to win again. Johnson's opportunity came as a race-ending rainstorm descended on Daytona International Speedway. It was time to go, and his aggressive pass on Paul Menard triggered a 16-car wreck in a field of 20. It was what he had to do to win an exhibition race worth little more than a trophy, and he was unremorseful as he watched video replays that showed him causing the crash. Johnson for a year has insisted he can still win a record eighth championship, and now he must do it with first-year Cup crew chief Kevin Meendering. Just as Knaus used qualifying to prove he's motivated in his new role, Johnson used the Clash to prove he's got a lot of fight left in him. The best car rarely wins the Daytona 500. And the racing formula for the showcase race is unlike the remainder of the NASCAR schedule, in which a completely different rules package will be used to determine the champion. These season-opening wins at Daytona are morale victories, nothing more. But it's exactly what Hendrick needed for his team to show it will be better this year.